What’s the future of newspaper comics? As of the last week of December 2015, the newspaper comic “Edge City” has ended its run. The reason given by its creators, Terry and Patty LaBan, is that they’ve said everything they had to say. They also don’t want to drag out the strip any further than necessary. Additionally, King Features Syndicate, the strip’s syndicate, also didn’t renew the creators’ contract, after the previous 15-year-long contract finally expired. The strip’s ending has also brought some discussion about the future of newspaper comic strips. The future of newspapers themselves doesn’t seem particularly bright (as print publications anyway). Similarly, the future of newspaper comics are also dim. I imagine it doesn’t help that for most people under 50, their favorite newspaper strips were ones that ended in the 90s. When asked, people still cite “Calvin and Hobbes” and “The Far Side” as their favorite strips. Perhaps fitting, given the 90s are the last time newspaper comics received much attention. Daily newspaper strips aren’t discussed very often online, even in comic circles. The only exception is sites like The Comic Curmudgeon, which mocks many of them. Editors tend to stick with what’s familiar, said John Glynn, president of Universal Uclick, the largest independent syndicate. Nuclear families and pets do well, he said; so do such stalwarts as Peanuts and Garfield. Not a wide range of subject material. Especially given most families aren’t traditional nuclear families these days. And should the newspaper page be using up valuable space for reruns of a strip whose creator died over 15 years ago, however classic “Peanuts” may be? 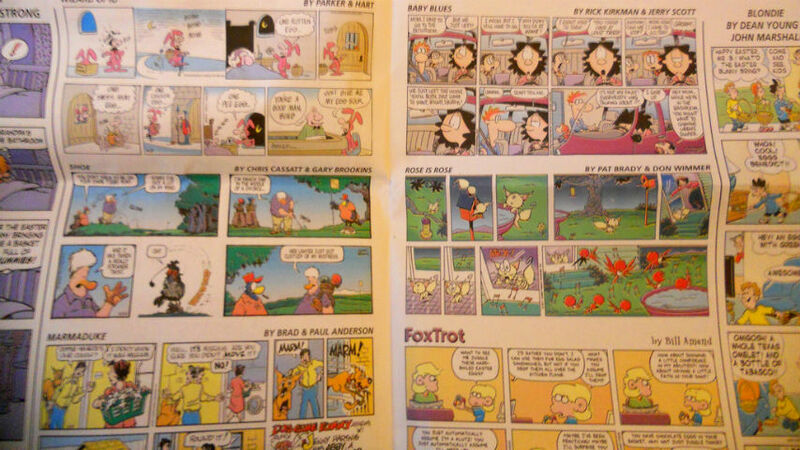 As I wrote in an earlier post, my newspaper strip reading is down to just three strips (both read online of course), “Pearls Before Swine,” “Monty,” and the Sundays-only “FoxTrot.” Webcomics, and a few alternative newspaper strips heavily distributed online, make up the majority of my comic strip reading nowadays. While there’s ample freedom in content and tone in webcomics, making money isn’t easy for cartoonists. Still, if the above represents the future for newspaper strips, it might be best for cartoonists to assume the future of comic strips will primarily be an online one.